When the iPad was first launched, it was seen by many as a media consumption device. You’d still require a full-fledged desktop or laptop running an operating system like Windows or Mac OS for making art and design which looked professional. Below you will find some of the best drawing apps for iPad that Kids love. Creating art on an iPad was something unheard of. With the growth in technology, Apple’s tablet has made a huge growth from being called just an ordinary media consumption device to something with which you can draw or paint your masterpiece. If you’re a graphic designer, illustrator or artist, you can sketch or paint effectively with an iPad. Invest on a high quality device and try some of these outstanding apps to create art on your iPad. Tayasui Sketches is a gracefully simple drawing and painting apps which has eight brushes on the left hand side. This ranges from charcoal and pencil to watercolour brush and felt pen. The pro version has two additional brushes. Each one of these displays its respective features in a brilliant manner, which indicates that you just have to pick up a brush and begin sketching. However, there are certain restrictions with respect to editing options. These sketches are a delight to be used by an art lover. Procreate 2 is heavily rated by artists, such as Pete Fowler-artist of Super Furry Animals album. It’s an accurate and speedy painting and drawing app which is capable of creating great artworks. The new version of this app will please everyone as it’s packed with the latest features like 4K canvases, 64-bit support and accelerated filters. Paper is a widely used writing and drawing app which is used to capture your sketches, diagrams, illustrations etc. This app can be downloaded free even though it has restricted functionality. The pro version has additional tools, colours and brushes. It has a clean, easy-to-use interface and you do not have to tackle any steep learning curve. ASKetch is an easy black and white sketching program which was made by Andrew Kern.This app is great for rookies as well as advanced artists and brings the charcoal drawing experience to your iPad. You can create almost everything with ASKetch from cartoons and figure drawings to masterpieces. Read this superb review on ASKetch. Even though there’s a free alternative of Adobe Photoshop Express, if you want some additional creative options while working on digital photography, then Adobe Photoshop Touch is the app to look for. It may not have all the refined tools that comes along a packed Photoshop package-however, it offers a lot in assisting you to boost your productivity. A special features is that it’s tailor-made for your tablet interface. It supports iCloud Photo Stream along with the presence of some outstanding tools within to boot. Brushes 3 refers to a painting app which was particularly designed for iOS. It makes use of an OpenGL-based painting engine which ensures a responsive and smooth experience. Layers can be used within the app along with multi-touch gestures and a host of adjustable elements. It also possesses Dropbox support. An outstanding feature of this app is its ability to create a video form of your painting process. Sketchbook series from Autodesk is available in various flavours for various platforms. Each one of these has a neat user interface with lots of tools to help you make your ideas a reality on your iPad. Even the free version has tons of pens, brushes and other drawing tools with which you can undo or redo. if you’d like more tools or brushes, you can always obtain more with in-app purchases. Inkist has a simple style but chic interface which is designed to be artist-friendly and highly responsive. This app can be used for a restricted time. So don’t waste your time and hurry! With this app you can create layers of various colours and flatten them on the background instead of depending on multiple layers. ArtRage app is an excellent software packed with all the necessary tools to produce outstanding art work. When launching the program, you’ll be directed to an array of watercolours and oils besides an unrestricted supply of blank canvas. The actions of blending and the overall results are of top-notch quality, although this is based on your talents to some extent. Infinite Design, meant for just Android devices, has all the tools to create handwritten notes besides drawing intricate and beautiful designs on your device with great ease. The app features an unrestricted zooming canvas, canvas wide-effects and canvas rotation which can be applied to your artwork. It allows you to create vector graphics with multi-touch gestures. 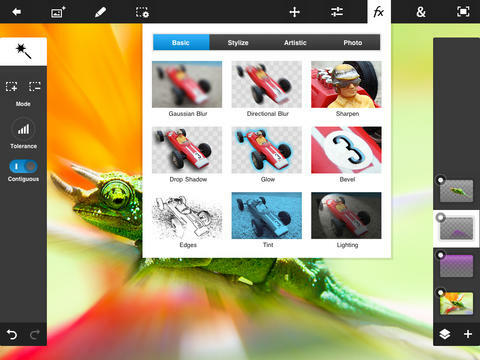 Layers for iPad is “an art studio in your pocket” according to its creators. It has everything you require to get creative. You can add a maximum of five layers to your art work. Along with a paint brush and an eraser, the app has a smudge tool with adjustable pressure, size and texture. Adobe Ideas app is a digital sketchbook which allows expression in vector format. It has a simple user interface, created for rapidly sketching out concepts and ideas. The app has a range of features like drawing tools which are vector-based with separate photo and drawing layers. Draft has only a single pen weight with just three colours-red, white and black. The team behind Draft developed it after they were tired of their original scan, sketch and email process. The app allows you to create a simple sketch after which you share it with your loved ones in a short time. Auryn Ink is a great iPad app used for watercolour painting. It has a restricted set of options compared to the other apps in this list. However, it covers a majority of the basics for watery art on your iPad. You can attune the canvas texture and the amount of water on the brush. Zen Brush has been created to be used with a brush extension with a stylus. It permits you to make brush strokes which replicate the feel of Japanese calligraphy brushes. It is minimalistic with respect to features but it does things pretty well.